OhmConnect pays you to save energy during #OhmHours. Connect your SDG&E to send us your home energy data. OhmConnect pays you to save energy during #OhmHours. The state requires that we prove that you actually reduced energy, and to do that, we need SDG&E to send us your home energy data. It's super simple. Log into OhmConnect and click "Connect." That will take you to SDG&E's website, where you will enter your utility credentials. 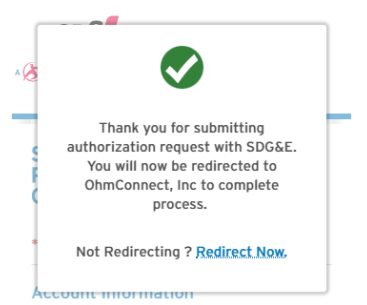 Once you have logged into your SDG&E account, you will land on a page where you can review the address that you are sharing with OhmConnect. Select "Ongoing" as your option to share data, and then scroll to the bottom to click "Submit." Great news - we don't ever store your utility credentials! So don't worry about any issues sharing your credentials. We don't have access and will never do anything with them. Select your current address if there are multiple. If you're having trouble, contact support - we're here to help!